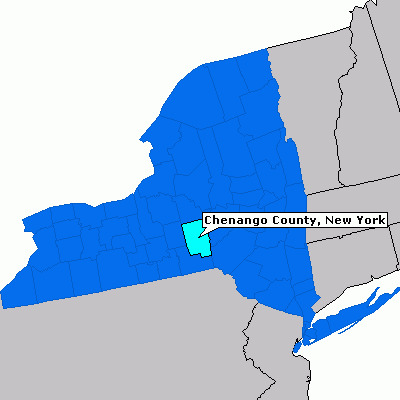 My Bigfoot sighting occurred on our Dairy Farm in Chenango County, South of Bainbridge, NY in May, 1961 when I was 14 years old. The sighting was around 1 pm in the afternoon in our farm hillside woodlot which was made up of primarily Oak, Maple, Cherry, and Beech trees. At the time, I was active in boy scouts, and having my own camp site was a priority. I located my campsite next to a small spring. Now to a 14 year old boy, this meant all the comforts of home in a campsite. Plenty of wood for campfires, plenty of water, and plenty of protection against the elements in this section of woodland. I was going into the campsite, when I heard a rustling noise at the spring. Thinking it might be a deer coming in for a drink, I moved as quietly as I could in the underbrush. Instead of a deer, about fifty to hundred feet from me, up rose this coal black form, looking directly at me. At first I couldn't figure out what I was looking at. My brain just couldn't sort it out. It wasn't a bear. In the shade of the trees, it's eye reflected a brilliant yellow, and it's coat was shiny black.... Very broad shoulders, no neck to speak of and it's head was rounded like a human's. What bothered me was I could not discern a face. It seemed covered in hair. The eyes seemed to be peeking out of hair that fell over its face. It's arms were at it's side, and I could not see below it's torso, as brush covered it's lower half, so I could not see it's hands, or feet. It had a very board trunk. It would estimate it's height at around 6 feet. It just stood there swaying side to side looking at me, as if to say, "What I am looking at?" just as I was. It never made any sound. Now I had heard of Bigfoot. Ol' Dad had a subscription to True Magazine and I had read Ivan Sanderson's stories (Jerry Crew, Ray Wallace & John Green etc), but Bigfoot lived in the Pacific Northwest, not the East. When it dawned on me that I was looking at a Bigfoot, shear panic and fear gripped me. I blasted out of there like a rifle shot. I ran down through the woods to a four strand barbed wire fence that separated the woodlot from a Christmas tree plantation, and cleared it easily in one jump. At this point I lost my sweater that I had tied around my waist. (It had warmed up considerably that day) I continued to run through our Christmas tree plantation, cleared another fence, and when I reached open pasture looked back. Nothing was following me. I made it back to our farm buildings in record time,(about a half mile from the sighting location) when I realized I had lost my sweater. If I recall correctly my parents and younger brother were away at the time on a shopping trip to Binghamton, NY and I was by myself. I decided to go back for my sweater, so I went to our farm shop and got out our trusty Stephens single shot shotgun for courage, (I knew it would not kill - let alone stop a Sasquatch) and went back after my sweater. As I approached the fence where I lost it, I could hear something walking up the fence line. It must have known I had come back, because it sounded like it was stomping branches as if to say, "don't come near me, stay away." I found my sweater, neatly draped over the top strand of the fence (?) and tried to follow the Sasquatch up the fence line. There were several times I knew I was getting near him, but could not bring myself to get closer. Finally, I gave up my pursuit, and went home. As I review this event, I would say I probably surprised a juvenile who was drinking at the spring. I would estimate it was a male as I saw no breasts, or female features. Regarding the hair hanging down over his face, I note that Loren Coleman has written about this feature of the Ohio Woolie Booger or other Eastern sightings. It could be that he came up so fast from getting a drink that he didn't have time to slick his hair back. I have told few people about the event. Later I told my family I had seen a bear. I note that many after a sighting are afraid to go back to the sighting location. I was never afraid to be alone in the woods, however, I noticed in early February or March I would feel at times as if I was being watched, however, it seemed that was the only time of year that I felt uncomfortable. 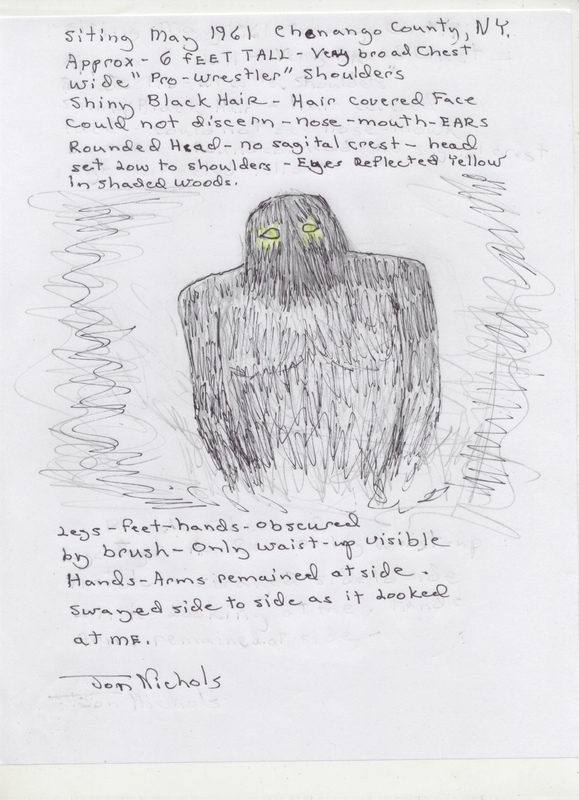 Since I moved to the Northwest in 1987 I have kept up my investigations, however I have never seen anything like it since, yet I have experienced a couple of incidents where I believe I heard howls or calls.